Look Sharp, Sconnie - Midwestern Fashion Nerd, Chronic Over-thinker: The Most Retweeted Tweet of All Time. The Most Retweeted Tweet of All Time. 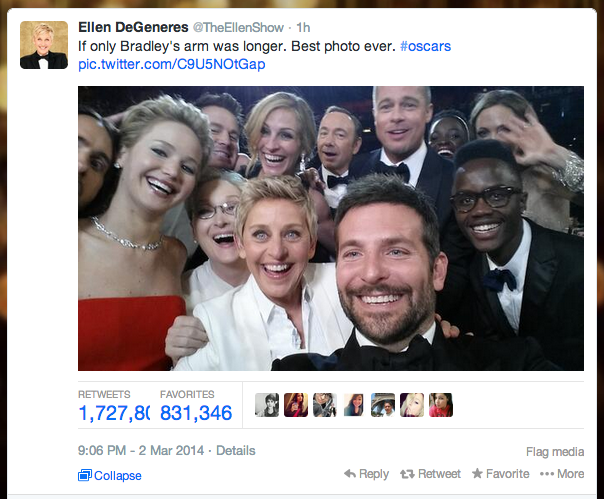 It was, officially, the most re-tweeted tweet of all time. I therefore feel like the key to my, and everyone around me's, success lies in the appeal of aforementioned photo. So let's break it down. 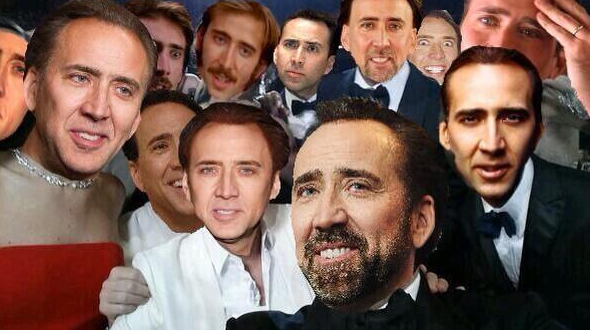 What made this one celeb "selfie" (or "usie" as one Tweeter so cleverly asserted) so damn alluring? #2. They're from different worlds, but besties all same. You know that weird happy feeling that ignites within you when your favorite actor makes an unexpected cameo in your favorite movie? Or when your two favorite housewives put aside their financially-rooted differences and hug it out over several bottles of chardonnay? It's like this strange collision of all things beautiful and cool taking place within one explosive space. For example: did anyone watch the pre-show? Did anyone see how Robin Roberts talked for like, an excessive amount of time, about how super amazing it was that B Cooper and Jonah Hill were friends "in real life?" "Only here!" she said! That's what makes this so special! That you all get along! It's like, for our whole lives - we've taken all of our insecurities about not fitting in with the cool kids, projected that onto our favorite celebrities, and then remained determined to watch as they rip each other apart. Enter: the tabloid. 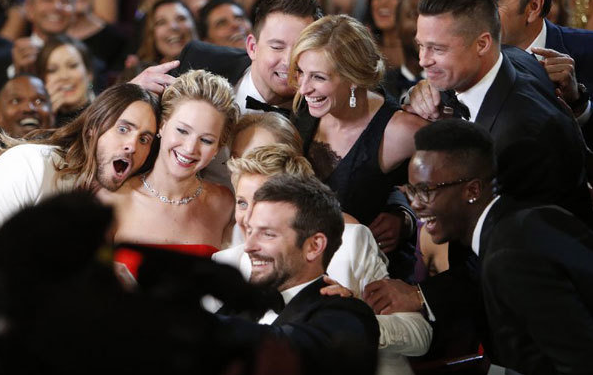 Then, all of a sudden, when Angelina Jolie and Jennifer Lawrence glow of positivity in the same space, we become simultaneously infatuated with, and infuriated by, the idea that so much coolness can interact positively in the same space. We can't look away. We're transfixed by the strange mix of jealousy and admiration. They're eyes are, like, glowing guys. Coop looks like he's about to tear up. I'm also pretty sure that Brad's mild smirk is the most emotion I've seen him physically convey. Ever. 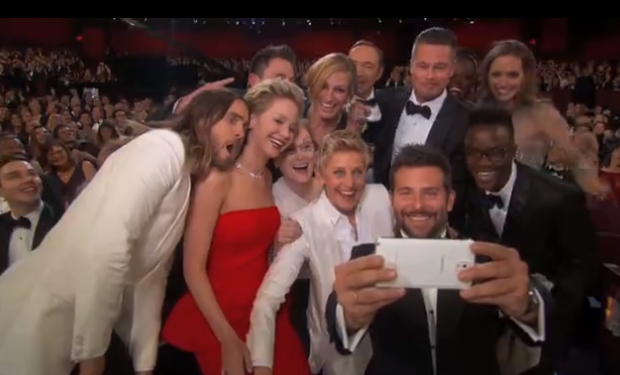 And look- Meryl Streep looks like such a happy dufus. Which makes us all love her even more. Which was somehow not possible but now is. And Angelina Jolie is hinting at signs of human behavior. A wave! 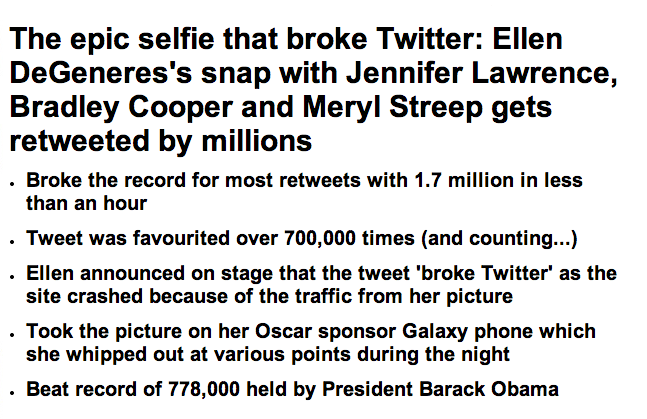 The most physical engagement with the public we've seen from her since her leg broke Twitter. So what have we learned? What can we take away from the viral nature of this little snippet of celebrity? I know that when I look at this picture, I come away feeling both envious and inspired. I envy their relationships - their club, of sorts. Yet, I'm inspired by the idea that all of these people can be doing exactly what they love, happily, and be confident enough in their own careers to appreciate & respect those of others. Or maybe actors are just really good at feigning friendship?? even staying home sick this morning (for real, i wouldn't wish this on anyone), i still couldn't see the oscars (which for us are always monday morning...freaky, huh). 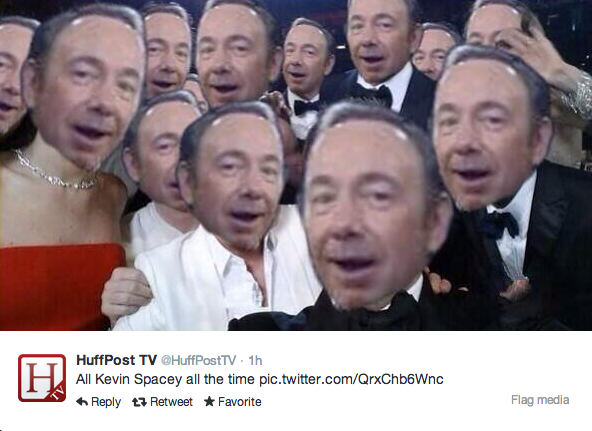 so, thanks for this recap of one of the most tweeted moments of the oscars. 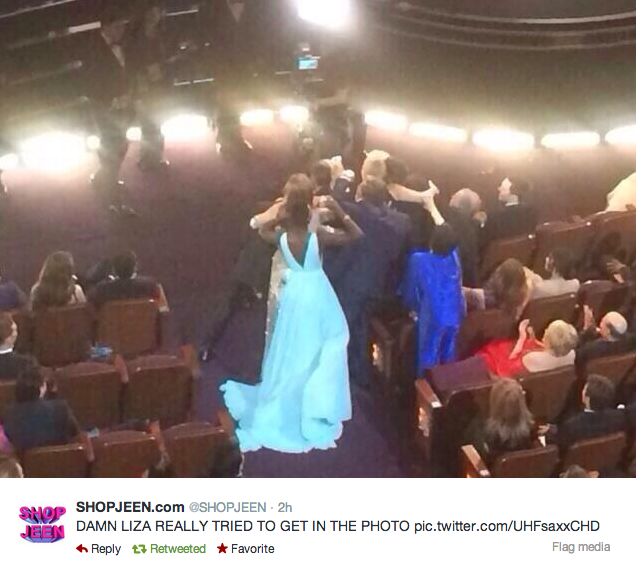 now i've got to look at all the 'news' sites for the best moments of the oscars...speeches, falls, best gowns, etc. sigh. the glamorous life of living abroad during these events that i used to love to watch when i was in the states. This was AMAZING and I totally re-tweeted it.